Some great effects can be achieved with filters. Screw a small flat plate of glass onto the front of the lens and you can radically change your image. UV filters block Ultraviolet light. Many photographers have them semi-permanently attached to all lenses to act as scratch guards. and improve the saturation of images. Anyone who enjoys landscapes and in particular water photography should invest in a polarizing filter and start to play. Filters cost just a few pounds, so needn't be a big expense. In addition, second hand filters are readily available and haven't changed since the days of film. 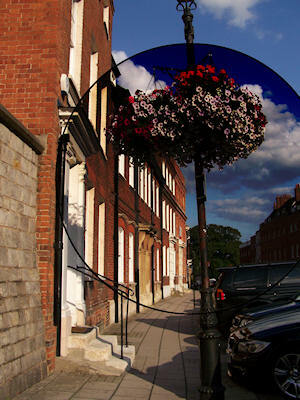 Enlarging filters are basically simple convex lenses placed on the front of the camera. They multiply magnification and although not as optically perfect as a macro lens, can really produce great shots. They generally come in packs of 3 4 or 5 filters that can be added together or used individually. However, these are to be used with caution and handled with care as they can easily show up abberations. Neutral Density (ND) filters just cut down the amount of light coming in. This is useful on a bright sunny day if you want to take a long exposure or want to open up the iris to achieve a shallower depth of field. With really strong filters you can run very long exposures in daylight. This can give amazing effects such as automatically removing people from what would normally be a busy street scene. A great variation is the Gradient ND filter (commonly referred to as an "ND Grad"
This is a filter with a transition from dark to opaque. Some ND Grads have a smooth transition (soft ND Grad), while others have a sharp line dividing the two different opacities (hard ND Grad). A hard grad is used when there is a sharp change in brightness. For example a straight horizon. Either hard or soft is commonly used to darken a sky, allowing for a more evenly exposed photograph without having to fix it in photoshop. Another type that you commonly see is the vignetting filter which produces a darker edge and lighter centre, like a radial soft ND Grad. Black and White Photos can be radically altered using blue, green, red or yellow filters to cut out certain wavelengths of light from your final image. 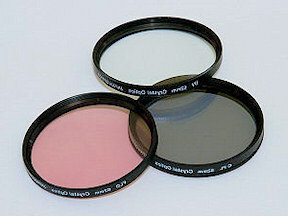 Another popular variant is the IR filter which only allows infra red through. The final type that you commonly see is a plain glass filter. These can be useful if you want to soften parts of a shot with a smear of Vaseline.